The extra virgin olive oil is the noblest of vegetable fats for its quality and its beneficial features for health. The juice of the olive oil is the jewel of the Mediterranean diet , considered by experts one of the healthiest diets in the world. 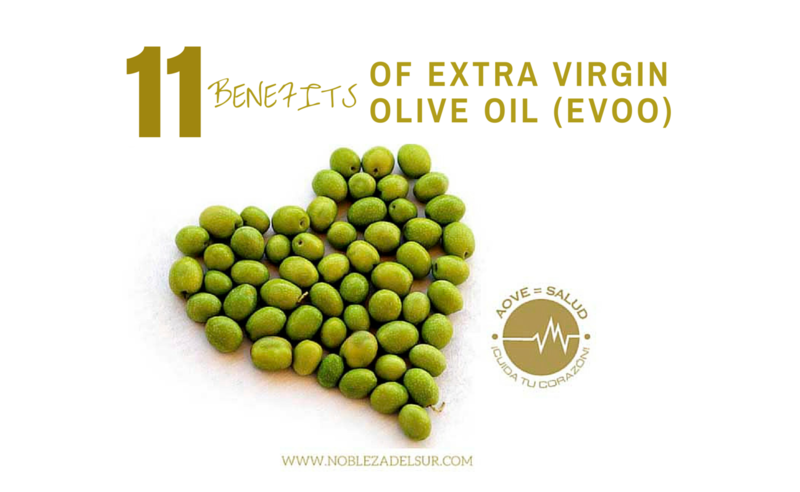 That is why the extra virgin olive oil Nobleza del Sur is gaining more followers because of its multiple benefits. Do you want to know what are some of them? Basis of the Mediterranean Diet. The findings of the investigation in the PREDIMED research advise us a healthier Mediterranean diet: Supplementing our diet with extra virgin olive oil and nuts, it was reduced by 30 % the incidence of major cardiovascular complications. Acts on the hepatobiliary system, which is directly related to the digestive system . EVOO stimulates gallbladder function, reduces the formation of gallstones and helps dissolve and even expel the already formed stones. Improves the functioning of the digestive system . EVOO reduces gastric acidity, stimulates the intestinal transit, favors the absorption of nutrients and enhances anti-inflammatory properties (which help soothe gastritis). In addition, the extra virgin olive oil prevents all types of cancers related to digestive system due to its high content of hydroxytyrosol. It is a phenolic compound (and one of the most potent antioxidants ) that inhibits cancer cell proliferation. Improves metabolic brain development and function. EVOO favors the formation of cell membranes and brain tissue. People who consume more monounsaturated fats containing olive oil, have cognitive improvements over time. Curbs your appetite. Having olive oil in your diet constantly makes you feel full and tends to eat less and have fewer cravings for sugar. Arteries more elastic. Consuming two tablespoons of olive oil at day makes you more resistant to shock and heart attacks. According to an study by the Lipids and Atherosclerosis Unit of the Reina Sofia Hospital , consumption of extra virgin olive oil rich in polyphenols improves levels of blood factors, reducing, among other situations , the risk of thrombosis. Reduce the risk of stroke in the elderly. Older people who eat diets rich in olive oil, have fewer strokes in a study of 2011. Its high content of polyphenols can reduce by 30 % the risk of cardiovascular diseases such as myocardial infarction or stroke, leading cause of death worldwide. Helps fight breast cancer. An in vitro study on hydroxytyrosol and tyrosol minority components of University of Jaen demonstrates the preventive function of breast cancer specifically as inhibitors and with antioxidant effects. Prevents Alzheimer’s. Olive oil protects against cognitive impairment due to the action of its antioxidants, preventing the development of neurodegenerative dementias and Alzheimer’s disease. Ally against aging. Its high content in polyphenols and vitamin E (natural antioxidants ) contributes to the prevention of damage caused by free radicals in the body tissues, mainly responsible for aging. In fact, Jaen is the Spanish province with the highest life expectancy and , as reported by various studies, the cause is olive oil. Reduces cholesterol. Oleic acid in olive oil lowers LDL or “bad ” cholesterol. To produce high-density lipoprotein (HDL – “good” cholesterol) which collects unused cholesterol and sent to the liver to remove it, you had better take foods rich in oleic acid.